People come in complaining of a toothache and infection in their upper teeth that seems to extend up into the roots. They usually don’t expect the massage therapist to get rid of the pain, they are just complaining about their teeth. I get a little more of these cases as my clients know that I can get rid of most tooth pain. This pattern occurs as mostly a feeling of infection and sensitivity in the upper premolars and first molar. In the picture below, 3 teeth are highlighted in red. The back tooth is the first molar and the two in front of that are called premolars or bicuspids. It is that yucky toothache feeling that where it feels like it is infected into the root of the tooth. I had this referral pattern several years ago. I had a pulp cap go bad in the first molar and there were some root fragments in the maxillary cavity that got infected. I started hunting for a good dentist but I went ahead and released the trigger points so that I didn’t have pain while I was looking. The pain and infected feeling were almost exactly like this illustration. When I released those trigger points, the pain and infected feeling in the two premolars went away. Those teeth were not a problem when examined on the x-ray. I had an extraction of the root fragments which is usually a fairly traumatic procedure that puts people down for a few days. It is a lot like having wisdom teeth extracted. Most of the post-procedure pain can be avoided if you can get the trigger points released. I had the roots extracted on a Thursday afternoon at 3:30. I was clear-headed and edited documents all evening for an upcoming seminar. I felt good and worked with clients all day Friday. I taught a seminar on Saturday. The only inconveniences that I had were around handling the surface of the extraction, like avoiding solid foods. Most of the time when I see tooth pain that is generated by trigger points, it is because of the posturing and pressure created by the dental procedure. It can also be caused uneven chewing because of a fragile tooth or chewing on things like toothpicks, popcorn kernels. 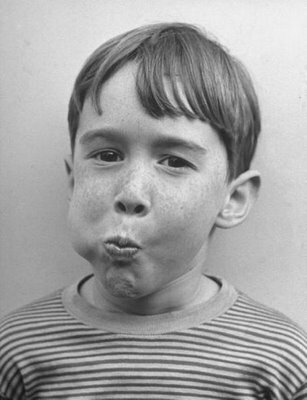 Sometimes it is caused by more laborious chewing of foods like taffy or bubble-gum. Most tooth pain comes from trigger point referral. When there is strong pain that occurs as something hot/cold hits the tooth, that’s usually pain from an exposed nerve and needs prompt dental care. The rest of those toothaches seem to be connected to trigger point referral. If your therapist is trained in the treatment of TMJ with neuromuscular or craniostructural techniques, they can help you avoid unnecessary pain and discomfort in your teeth. 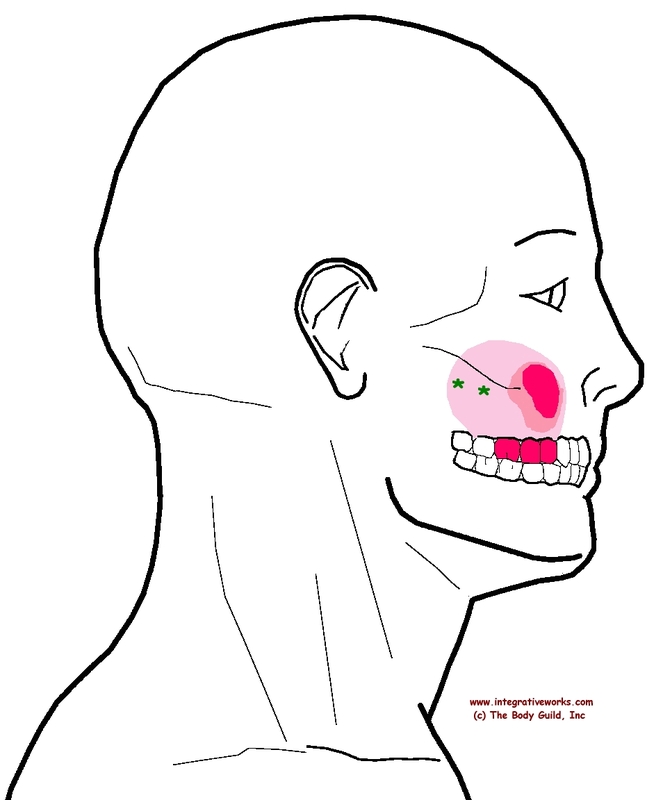 The trigger points are just under the arch of the cheek bone. Pressing on this knotted muscle makes the sensation in the tooth and roots flare up with a little relief afterward. It is easy to aggravate the trigger point and the tooth infection this way. Try Ice and Stretch on your jaw and you’re more likely to get temporary relief.